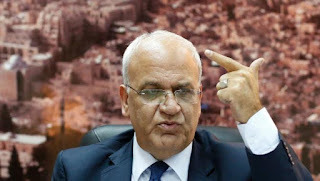 RAMALLAH — Palestine Liberation Organisation senior official Saeb Erekat on Monday blamed Israel's prime minister for nearly two months of deadly unrest, on the eve of key talks with the top US diplomat. Erekat, who has served as the Palestinian chief negotiator, also stressed in an interview with AFP that he did not condone killings, but declined to outright condemn a wave of Palestinian attacks targeting Israelis. The PLO secretary general's comments came ahead of talks with US Secretary of State John Kerry, who will meet with Palestinian President Mahmoud Abbas and Israeli Prime Minister Benjamin Netanyahu separately on Tuesday. Erekat said if nothing concrete comes out of the meetings with Kerry, the Palestinians could move forward on changing longstanding links with Israel, including security coordination. Kerry's visit comes amid nearly two months of violence, including Palestinian knife, gun and car-ramming attacks. 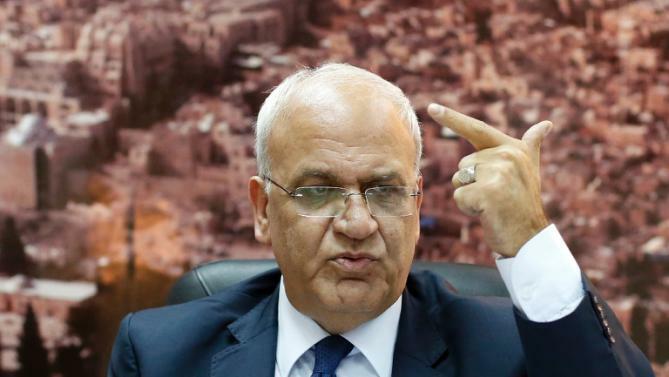 "I condemn the policies of Benjamin Netanyahu," said the 60-year-old Erekat, who will participate in Tuesday's talks. "Yes, and I hold him responsible. I hold him responsible for this deterioration." He accused Netanyahu of cutting off the hopes of young Palestinians by refusing to recognise a Palestinian state according to 1967 borders and allowing Jewish settlement building in the occupied West Bank to continue, among other issues. “We really hope, and I really hope against hope, that Mr Kerry will succeed in getting from Netanyahu a commitment to carry out his obligations,” Erekat said. He said later that Abbas “promised Kerry that we will not move until he comes, so it depends on what he brings tomorrow. Peace efforts have been at a standstill for more than a year, and Netanyahu has sent mixed signals about his commitment to a two-state solution. At the same time, the Israeli prime minister has accused Palestinian leaders of helping incite the current wave of violence. On Monday, three Palestinians and one Israeli were killed. The violence since October 1 has left 92 Palestinians dead, including one Arab Israeli, as well as 17 Israelis, an American and an Eritrean. “I condemn those who destroy hope,” Erekat said when asked if he saw a need to condemn the Palestinian attacks. “I condemn those who chose settlements and dictation rather than peace and negotiations. And I told you I don’t condone the killing of civilians, given it is Israelis or Palestinians. US officials said they were not expecting to strike any new agreement on a return to peace talks during Kerry’s visit, and would simply try to walk the parties back from the immediate violence. Abbas in his speech to the United Nations in September said he was no longer bound by accords with Israel. “We will not remain the only ones committed to the implementation of these agreements,” he said. There have been threats to pull out off the 1990s Oslo accords, which formed the basis of the peace process but have not led to an independent Palestinian state. Erekat said a lack of immediate progress could result in concrete actions taken, including involving security coordination with Israel.